Soil color is like a family tree. It tells scientists about the present and the past. Just as the family tree might help explain how you ended up with curly hair, soil color reveals the composition of soil, plant life and other insights. Scientists use Munsell Soil Color Charts and Books to visually analyze the color of soil. Here’s how it works. 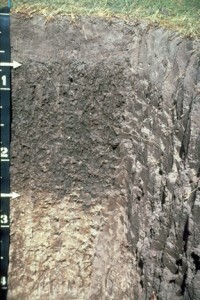 At a very basic level, a cross section of soil indicates a darker color at the top level or surface horizon. At this level, the soil color may appear darker. Why?… because of organic matter such as plant roots and leaves that decompose into the soil causing a darker color. As you examine soil color in the lower horizons of the cross section, you may notice a lighter color. That’s because there’s less organic matter. So What Does Soil Color Really Tell Us About the Composition of Soil? The Soil Science Society of America tells us that “soils are complex mixtures of minerals, water, air and organic matter (both dead and alive), forming at the surface of land.” The varying levels of minerals, water, etc. can affect the color of soil. The color of soil helps agronomists understand soil composition and classify it so that farmers can produce optimum crops. Soil color tells agronomists if soil is lacking essential nutrients such as nitrogen, phosphorus and potassium. Analyzing the color of soil helps land planners easily identify if an area is fit for use. Will the soil allow for proper drainage? Will it allow too much runoff? Is it suitable for building upon? These are just a few of the questions soil color can help answer. The color of soil is a quick, visible indicator that scientists use to determine everything from land use to soil conservation. The Munsell Soil Color Book and Soil Color Charts accompany scientists in the field or in the laboratory to help them easily examine and classify soil based on color. U.S.D.A. Natural Resources Conservation Service If you live in the U.S., this site will tell you all about your state’s soil. Soil Science Society of America Excellent resource on soil, educational programs and more. Dig It! The Secrets of Soil Perfect for children or adults interesting in learing about soil including the 12 soil orders found throughout the world. Read New York Times blog post “Soil Samples and Peanut Butter” to see how scientist, Amanda Schmidt, is using Munsell Color Charts in the field. Hi, I need your assistance in identifying the type of minerals. On my farm, I suspect there could be some minerals. I have said so because along the stream the soil at one point (place) seams to have a different colour blue/greenish and in the morning you would find some bubbles and the colour changes to purple/greenish. Question. Please assist me with the types of stones that may be there.